Happy Friday! 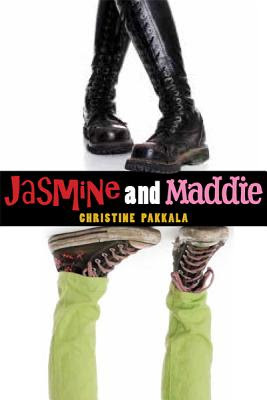 Christine Pakkala dropped by to finish my sentences. We chatted about Lola, Paul Hoppe, reading, school libraries, and geometry. I wrote the words in orange, and she wrote the words in black. Thank you, Christine! 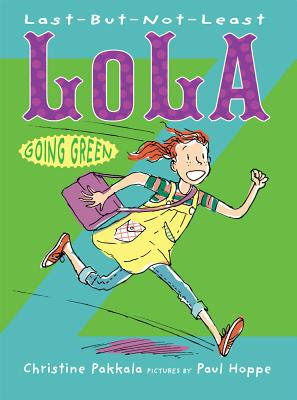 The Last-But-Not Least Lola series follows the adventures of Lola Zuckerman, who never means to get in trouble but sometimes does. Part of the problem is that Lola’s teacher, Mrs. D. LUH-HUVS the alphabet (and alphabetical order). Sometimes it’s really hard to wait all the way from A to Z. Especially when your best friend is Amanda Anderson and she always goes first. When you’re last to give your Going Green idea, or last to pick a partner on a field trip, that can be a problem. But Mrs. D. encourages Lola to be a problem-solver. In each book, Lola tackles being last—and other problems—with zest and humor! Amanda, Jessie, and Savannah are Lola’s three best friends. Well, it would be great to keep Amanda Anderson all to herself, but life (and second grade) doesn’t work that way. First she has to share Amanda with Jessie and then the new girl, Savannah, wants to be friends with Amanda, too. 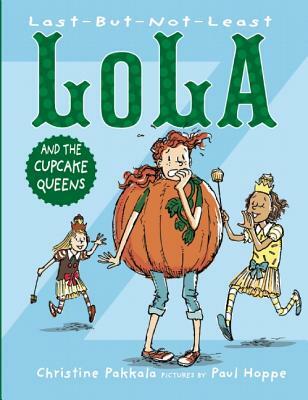 But Lola (maybe just maybe) discovers that three friends are better than one. Maybe one of those friends likes to roll around in mud? Maybe another one likes to play hot potato with an ice pack? 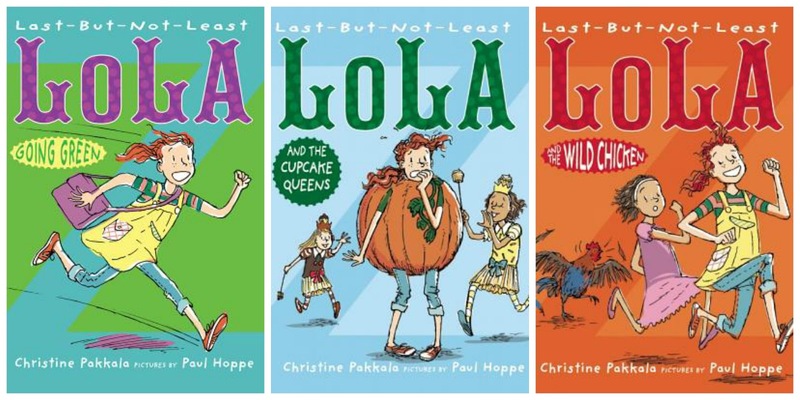 Paul Hoppe’s illustrations bring Lola to life! 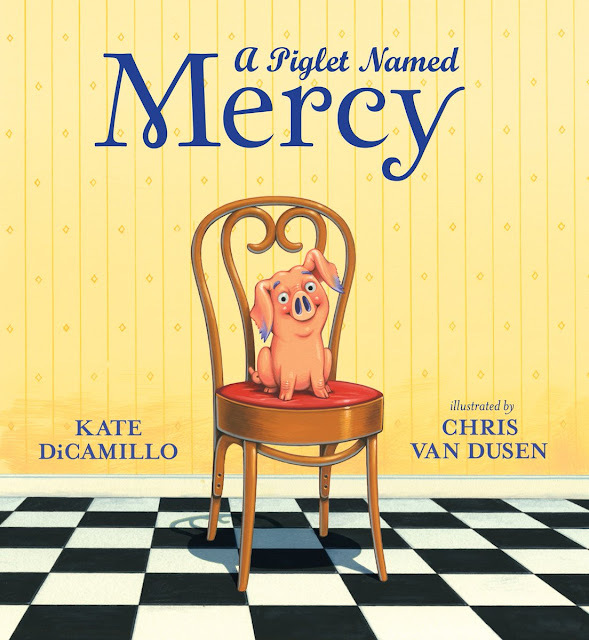 He not only illustrates these stories but adds “story” to the story. In the first book, Lola thinks it would be great to sing “ABZDEFG…” and Paul illustrates that by having her rearrange alphabet blocks to suit herself. I love the way Paul sometimes creates a birds-eye view of the scene, looking down at the action. I also love when he creates thought bubbles. In THE WILD CHICKEN, he draws a picture of Lola worrying that poor Jessie was getting stitches…with a sewing machine. Brr! When I was Lola’s age I sat in a tree and recorded license plate numbers of passing cars in a little notebook. I was sure I was going to catch a criminal that way. I’m sure I could have convinced Lola to sit up in the tree with me. Reading is everything. This world is full of wonder, but every time I pick up a book, I get to travel to a new world. Travel! Without luggage, lines or jet lag. School libraries are my favorite place in the school. There’s always something interesting going on in there. At my local school library, Barbara Eilertsen is never sitting. She’s giving presentations to kids, introducing them to (ahem) authors, conducting radio broadcasts…you name it! I love all the activity in the school library, but I also love the books and the invitation of each one of those books to find a quiet corner, sit down, and read. 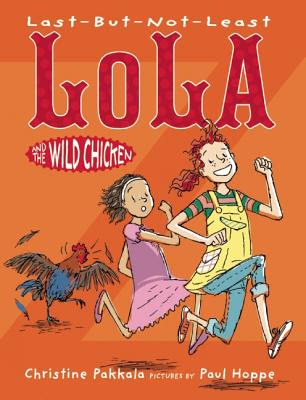 Mr. Schu, you should have asked me why do I love writing Lola books? When I was in Geometry class in 9th grade, I used to sit behind this big, popular kid named Damon. Our teacher was a no-nonsense guy named Mr. Albert. He wore his hair in a military-style crewcut and he wore black-framed glasses way before it was retro and cool to do that. I can’t remember a single time he ever smiled. He probably did but not around us. Every time Mr. Albert had his back to us and was writing all over the board, people started talking. Not me. I never said a word. Instead I daydreamed. That triangle looked like a slice of pizza. Isosceles sounds like sloshily. One day I somehow got the courage to whisper one of my funny thoughts to Damon. He laughed. And then he repeated it in a loud voice to the rest of the class. And everyone laughed. Mr. Albert turned around and glared at all of us. I think it was the proudest moment of my ninth grade life. Never in a million years would I ever be the one to tell a joke to the class. I was too afraid, I guess, to break the rules. But even more than that I was too afraid that what I said wouldn’t be that funny. It would just be weird. Or even worse, I wouldn’t be able to make my quiet voice heard. That’s part of the fun of being a writer and creating characters, especially one like Lola. Lola talks in all Caps a lot. She sings, she talks, she shouts. It never occurs to her to not speak up. She’s definitely not perfect. She lies. She gets jealous. She fights with her brother. Maybe there are times where she should be more like me. Maybe she should be quiet and listen. But she just hasn’t learned that lesson from the world yet. To be honest, until recently I’ve been thinking it’s okay to let Lola Zuckerman do the talking for me. I’ve been going along with the idea that there are people who sing out in class and there are people who don’t. There are artists and writers and shy types who’d just as soon keep their trap shut. But lately I’ve been thinking I don’t want to live the rest of my life afraid to let my voice be heard. I don’t want to let Lola have all the fun. I don’t want to be afraid—even if I feel silly and a big goofball—to just be that person who, when the spirit moves her, makes one of those shouts. I don’t want to worry anymore that people will think I’m a goofball. That’s my message to my readers: if there’s some way that you are afraid to make your voice heard, I would like to ask you to try not to be. I would like to ask you to blow your own horn. Pick up your guitar and play it. Write your story. Crack a joke. Sing along loud enough so that your voice soars right over Miley Cyrus’s. Be a goofball if you want to be. That’s what I plan to do. Borrow the Last-But-Not-Least Lola series from your school or public library. Whenever possible, please support independent bookshops.